This gorgeous hand-drawn Ballerina design kids piggy bank is the perfect gift for birthdays, christenings and as a gift for a new baby. 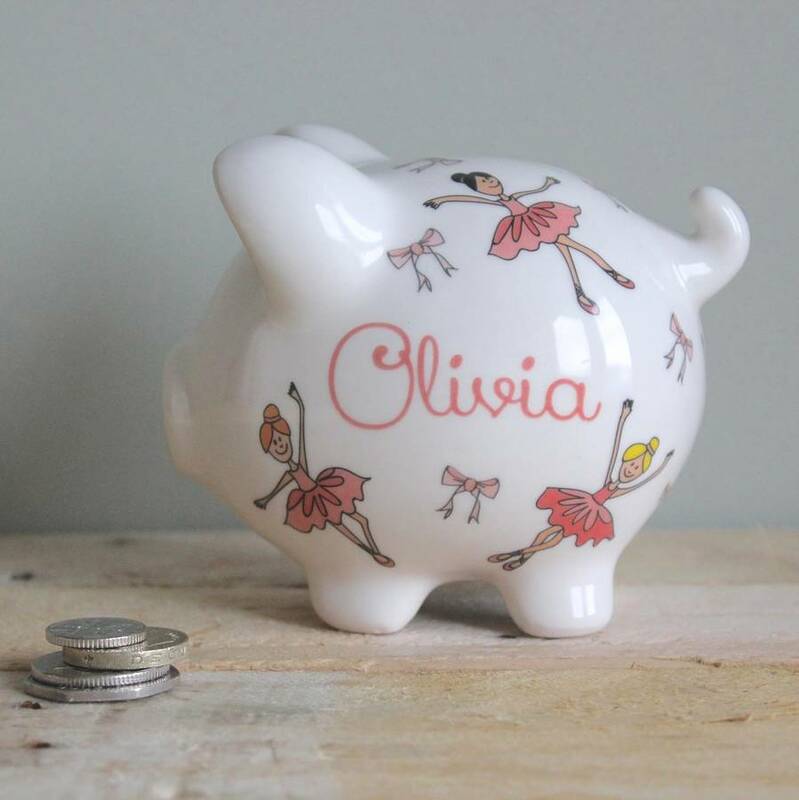 Kids love our personalised piggy banks, and this hand-drawn Ballerina design is very popular - it's a gorgeously simple but effective design featuring a row of pink dancers. 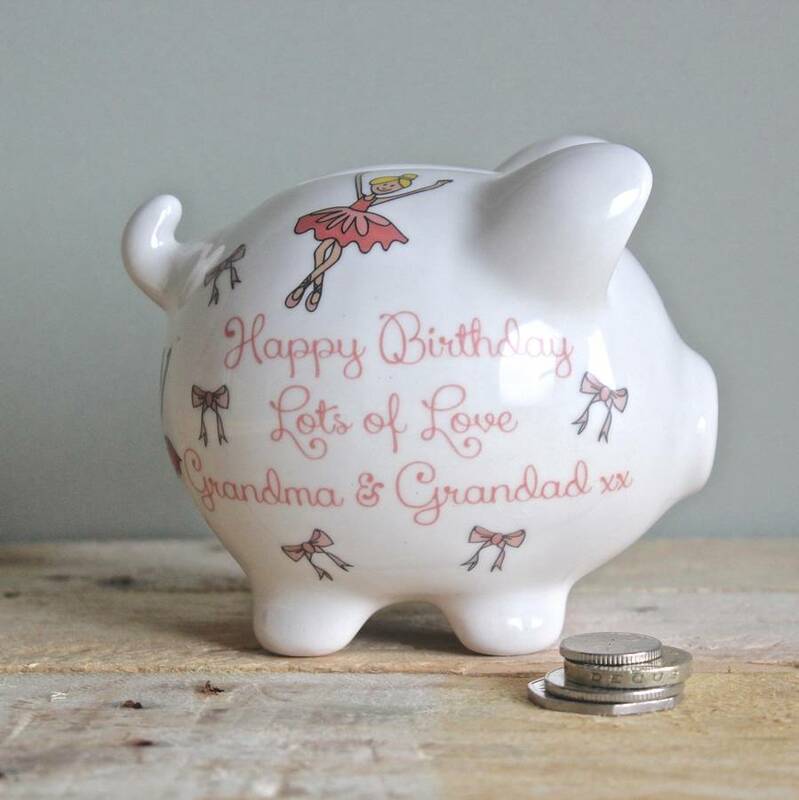 Piggy Banks are perfect for so many occasions - christenings, birthdays and new baby gifts. We also find them very popular as thank you gifts for bridesmaids and page boys. They're not just limited to being loved by children, they go down a storm with grown ups too! Our personalised ballerina piggy bank features pretty ballerinas, dancing amongst little pink bows and would make such a special gift for any aspiring dancer. The piggy banks can be personalised with a name and a short message (if you wish). You can see examples of this in our images above. The message on the reverse can be over three lines, with a maximum of twenty five characters per line. They have a rubber stopper at the bottom which can be easily removed to acccess the contents and are available in three sizes. The piggies are available in a number of different designs - Please click 'see seller's complete range' to see our other items. The piggies are made from earthenware ceramic. The designs are hand applied, glazed and kiln fired, creating a permanent finish. Height 13cm; Width 11cm; Length 16cm. This product is dispatched to you by Sparkle Ceramics.